The US Centers For Disease Control and Prevention have released new research showing that teen use of tobacco has decreased dramatically. For the first time in many decades, teen cigarette smoking rates (measured among high school students in their teens) are now below 10%, at 9.2%. At the same time, the CDC reports, teen use of electronic cigarettes has increased by 300% over the last year, with 13% of the students having tried e-cigs. Hookah use is also almost at 10% among the same age group. The CDC calls the e-cigarette findings alarming since the long-term effects of vaping remain largely unknown, and the findings have given new ammunition to those calling for stringent new regulations on electronic cigarettes. OUR OPINION: One would have thought that the anti-smoking movement would have pulled out champagne and cigars (bubble gum ones, of course) to celebrate the success of their campaign to reduce teen smoking rates. Those of us who remember when nearly 50% of high school seniors were regular cigarette smokers see the fact that fewer than 10% of high school students smoke as a quantum shift in teen behaviors, for which anti-smoking activists should take credit. 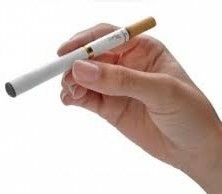 However…those who are overly alarmed that some teens are trying (or using) electronic cigarettes should spend a little time reviewing the literature on teens and risky behavior. A certain percentage of teenagers are going to experiment with whatever substances or devices are available – and 13% is a number which represents experimentation, not a pervasive trend. Of course, there should be age restrictions on availability of e-cigs. However, there are certainly age restrictions on alcohol purchase, and the CDC reports that 35% of US high school students drink (and 21% binge drink). 27 percent of high schoolers have used illegal drugs over the past year – and, need we say, they are completely illegal. “Huffing” inhalants and solvents is almost as common among younger teens as e-cig use is among older ones, yet the last time we checked it’s still legal to purchase paint thinner and glue. Less panic and more common sense might seem to be in order. But then again, that’s not the approach that the anti-vapers (or anti-smokers, for that matter) seem to take very often.